“You can’t fail if you are proud of what you do” is a motto that guides Micah’s actions, along with a core belief that everyone has a right to be who they wish to be. Since leaving Sauvé House, Micah obtained hir Master’s in Human Rights at the Central European University (CEU) in Budapest, Hungary. After completing hir Masters in the fall of 2014, Micah moved back to Stockholm. Since December 2014, zie has been working as International Advocacy Advisor at RFSL, the Swedish Federation for LGBTQ Rights. Micah is responsible for international advocacy within the organization, with a special focus on the United Nations system as well as working with the Swedish Foreign Ministry. Micah was heavily involved with the UN Agenda 2030. Zie worked as International Advocacy Advisor at RFSL, the Swedish Federation for LGBTQ Rights based in Stockholm and was invited to participate in panel discussions about the role of civil society in the Agenda 2030. In June, zie delivered an oral statement on behalf of the SOGI (sexual orientation and gender identity) constituency during the interactive dialogue with the Co-facilitators of the post-2015 process. Since October 2013, Micah is a member of the Executive Board of ILGA Europe, the European Region of the International Lesbian, Gay, Bisexual, Trans & Intersex Association, where zie was Co-Secretary. In 2011-2013, Micah was a member of the Advisory Council on Youth within the Council of Europe (AC), which consists of 30 representatives from youth NGOs. They provide opinions and input on all issues concerning youth within the CoE. The Advisory Council also ensures that young people are involved and their voices are heard in the institution’s broader activities. During hir mandate in the AC, together with a few colleagues, Micah focused on drafting a recommendation on the access of young people from disadvantaged neighborhoods to social rights. Born and raised in Poland, Micah long resided in Stockholm, Sweden. 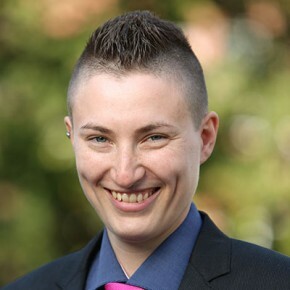 In 2008, Micah became president of ANSO, the Association of Nordic and Pol-Balt LGBTQ Organizations, which aims to question and combat heteronormativity in higher education. Micah has worked as a trainer in the youth field and as part of the Trainers’ Pool of the Youth Department of the Council of Europe (CoE). The themes of hir trainings include sexual orientation, gender identity and expression, human rights, inclusion, democratic leadership, disability and accessibility. In 2011, Micah completed a prestigious internship at the Office of the Commissioner for Human Rights of the Council of Europe, where zie assisted the Commissioner in publishing Discrimination of Grounds of Sexual Orientation and Gender Identity in Europe, a review of all 47 member states of the CoE, the first report of its kind. *Zie and hir are gender neutral pronouns. To learn more about gender neutral pronouns, please view this table. Micah focused on one of today’s serious violations of human rights: the forced sterilization of trans persons. This surgical process resulting in irreversible infertility is a prerequisite for legal gender recognition for trans persons in most of the countries around the world. Micah’s aim was to create a tool for activists who advocate for an end to this abusive requirement. Zie completed a submission to the UN Special Rapporteur on Torture, which addressed forced sterilization of trans* persons. Hir submission had a significant impact on the Rapporteur’s thematic report on torture in health care settings and led to its inclusion of forced sterilization in his mandate for the first time. The Rapporteur called upon States to “outlaw forced and coerced sterilization in all circumstances”, which was a ground-breaking statement for the rights of trans persons globally. Following the release of the report, Micah was invited to take part in a panel discussion at the UN headquarters in Geneva. It was focused on preventing torture and ill-treatment in health care settings. Micah spoke about the report and its potential in bringing change for trans* persons around the world. Zie also spoke about the states’ responsibility to implement it and change abusive laws on legal gender recognition. Following the release of the thematic report and the side event, in 2013 Micah’s article addressing forced sterilization of trans people was published in a compilation “Torture in Healthcare Settings: Reflections on the Special Rapporteur on Torture’s 2013 Thematic Report”. It presents texts from a number of experts from various fields who analyze and comment on the thematic report from their unique perspectives. "Trans youth rights: The battle over the bathroom"
"Consent Signed with Invisible Ink: Sterilization of Trans* People and Legal Gender Recognition"